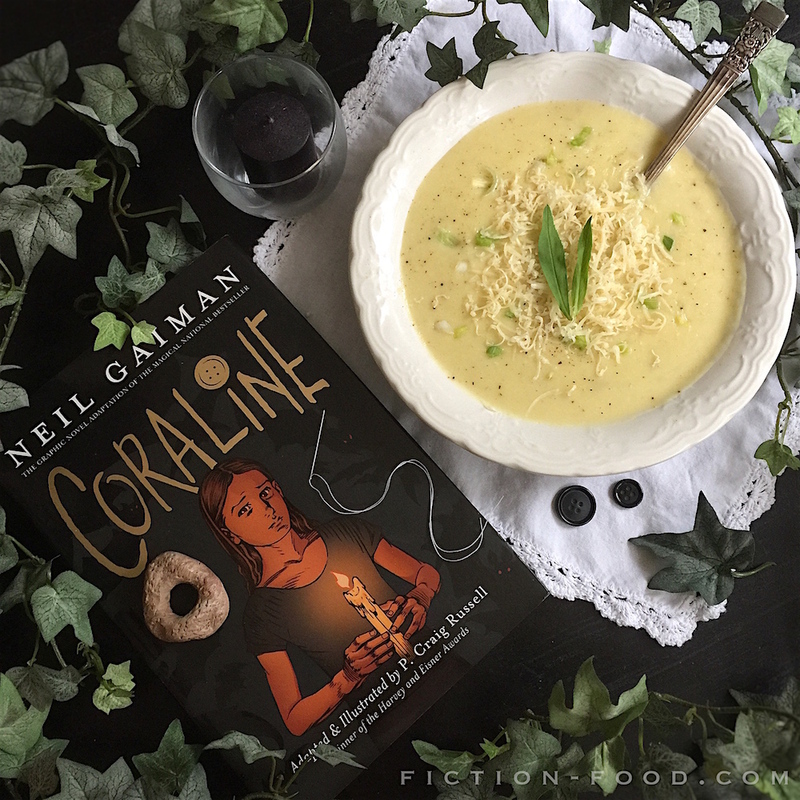 Coraline's father stopped working and made them all dinner. 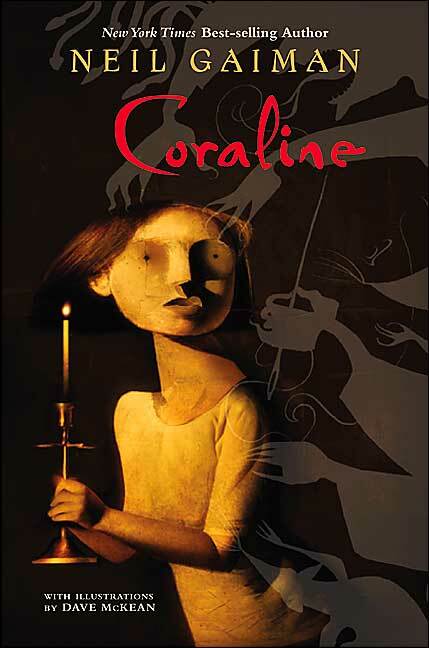 Coraline was disgusted. "Daddy," she said, "you've made a recipe again." I can assure you that this is not disgusting! No backup microwave food needed ;). 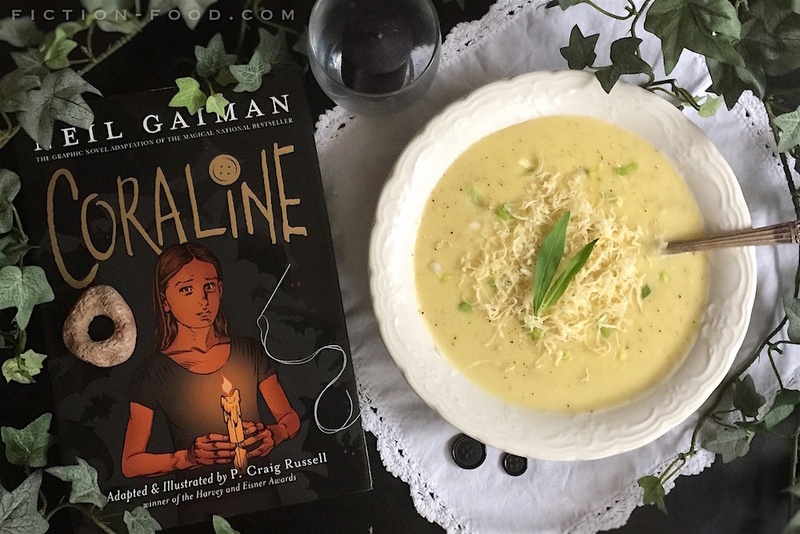 Coraline's dad is a good guy, and creative with food, which I can respect. This little scene is at the beginning of the story and shows how picky and persnickety Coraline is. Through the course of the story though, she gets out of herself more and becomes kinder, even eating her dad's cooking at the end :). I wanted a smooth & creamy soup so I blended it all with an immersion blender and it was fantastic. In the book it's called stew though, and in the comic adaptation (also called stew) it looks pretty chunky, like mac & cheese, so below I've given some options in the recipe (step 3) for chunky, a little chunky, or smooth (pictured). 1. In a large pot on medium-high heat, melt the butter till it's slightly nutty smelling (it'll foam up before this). Add the diced leaks, garlic, & salt, & stir to coat. Lower the heat, cover, & cook for about 10 minutes or until the leeks are tender. 2. Next, add the diced potatoes, bay leaf, & broth, & cook on high until it comes to a boil. Reduce to a simmer & cover, cooking for about 20 minutes, until the potatoes are tender. Remove the bay leaf. 3. There are 3 options at this point: leaving things as is (stew), blending half (still stew? ), or blending all (soup). –If you'd like it a little bit creamy (option 2), scoop half of the mixture out & into a blender. Leave a bit of the top open, hold a towel on top, & blend until smooth. Stir the smooth mixture back into the pot. –To make it all smooth (option 3, what's pictured), stir in the cheese & let it melt a bit. Use an immersion blender, or blend as above, but in batches, only filling the blender half way each time. 4. Stir in the pepper to taste, or sprinkle pepper on individual servings. Spoon into serving dishes & top with cheese & a tarragon leaf (I also sprinkled on a little bit of minced, extra leek). I can't believe somebody actually tried this recipe! Hahaha I always wondered how disgusting could it be...hmm...I should give it a try. 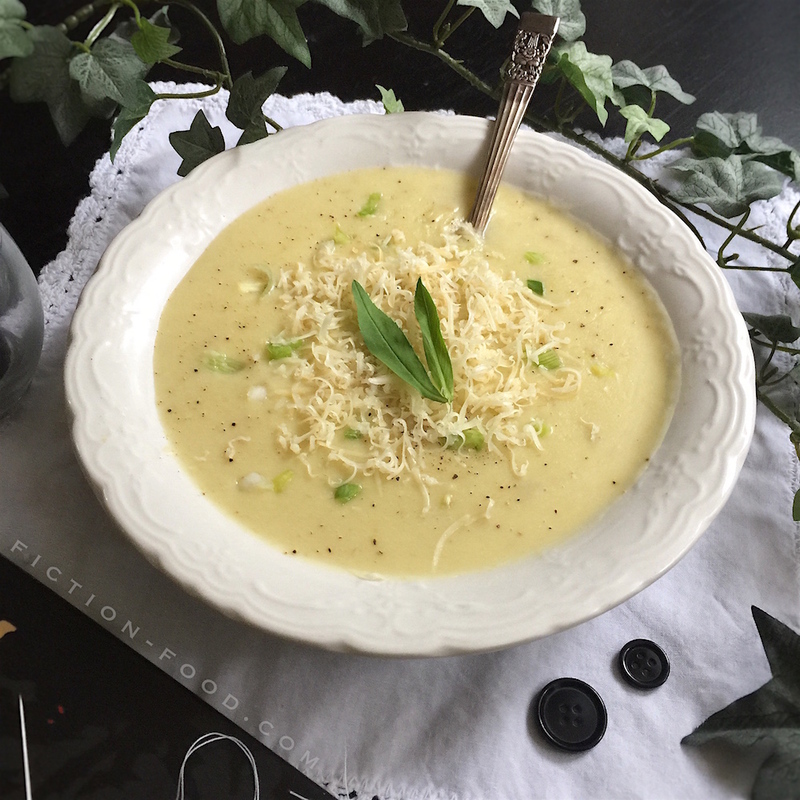 Potato and leek soup is a common recipe and one my family makes frequently. It's quite delicious and wonderful for a cold day. Just make sure to rinse the leeks thoroughly or your soup will be gritty.